At this moment, the only things more plentiful than Olympics coverage and Presidential faux pas are predictions of Snapchat’s imminent withering and demise, due to the near pixel-for-pixel mimicry of the newly launched Instagram Stories. Here’s but one doomsday account. Use your favorite search engine to turn up dozens more. Inconveniently, these proclamations of death are almost never correct. And the same is true in this instance. Snapchat has nearly the same usage in the USA as does Instagram. In summary, Snapchat has a user base that rivals Instagram, and a passion index that exceeds Instagram’s, especially among younger users. The same thing happened with MySpace. The same thing happened with Facebook (which of course was only available to youth at its inception, and as it became ubiquitous was largely abandoned by that audience). I’d argue growth and breadth didn’t do Twitter any favors, either. And this is not an online phenomenon alone. This hype cycle happens in technology of all types, as well as in bars, restaurants, and celebrity culture. Have you ever stopped liking a band because they got “too popular” and “sold out”? In short, the people who made Snapchat viable—young, early adopters—were destined to begin defecting elsewhere. But these core Snapchat fans will not flock to use another service unless that service offers dramatic differences and advantages. Instagram Stories may have a more intuitive interface, but that’s not game-changing functionality, and may actually turn off Gen Z users who prefer a little mystery in their UI. Instagram Stories will skim off the casual Snapchat users, attracting them via ease-of-use and better account growth and discovery features. But it will not attract the Snapchat core. Instagram Stories provides Snapchat with the opportunity to pull off a rare feat: a smaller—yet more valuable—social network. Yes, growth of the platform will likely slow, and Snapchat will begin reverting to its roots as the darling of youth. But they will be left with an increasingly homogenous audience of massively passionate users, who eschew most other social networks and other mechanisms for reaching them. With this move, Instagram ensures that youth will turn their backs on the platform the same way they turned their backs on Facebook. This makes Snapchat the only game in town when brands want to reach the fickle, highly valuable youth market, allowing them to charge higher rates for a smaller, more demographically pure audience. From an operations perspective, that’s all good news. The core doesn’t bail. You have real differentiation in the market. And you can charge more for ads and partnerships. From a valuation perspective, it’s probably less positive, as VCs who don’t actually understand social network dynamics and long-term monetization care only about monthly active users, growth rate, and trying to “catch Facebook.” This binary view will probably result in a flattening or decline in Snapchat’s valuation as growth rate slows. On the functionality side, analysts wringing their hands about Instagram copying Snapchat’s Stories functionality are missing the much bigger picture. This isn’t a technology fight, it’s a philosophical struggle. Zuckerberg and Facebook/Instagram believe that the citizens of the world fundamentally want to tell other people what they are doing—and the more the better—even if their relationships with those people are weak and algorithmically defined. Snapchat had a good way of doing that with casual video, so they aped it. Evan Spiegel and Snapchat have a fundamentally different worldview. Spiegel has talked in the past about Generation Z and young people as a whole preferring the “phone book” model of communication, where instead of trying to build an audience, they seek more intimate connections and share with a few “real” friends rather than many “pretend” friends. For the teenagers I’m around, Spiegel is 100% correct. They use Snapchat vastly more as a messaging app than for any other purpose. 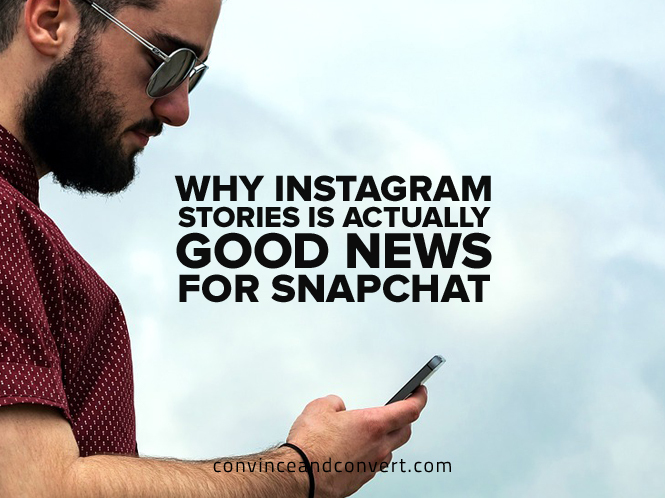 Stories is a fun diversion on occasion, but for them acquiring a bigger audience on Instagram with whom they can share their stories is not an objective. In reality, WhatsApp and Messenger are a much bigger threat to the large group that uses Snapchat for communications. So if it won’t “kill Snapchat” why would Facebook make such a huge change to Instagram, a platform that was doing quite nicely on its own? Most of the content 10 years ago was text, and then photos, and now it’s quickly becoming videos. I just think that we’re going to be in a world a few years from now where the vast majority of the content that people consume online will be video. Of course, if Facebook becomes the dominant purveyor and curator of all that video, their collective control over the world and its inhabitants grows accordingly. But even with the Facebook Live rollout, the move to video as the atomic unit of human connection isn’t moving fast enough for Zuckerberg and Co. Thus, they are attempting to accelerate this transformation by morphing Instagram from a photo sharing platform to a new creature that makes creating video easy, fun, casual, and viable for all humanity in a way that “live” never will be. In fact, watch for an even tighter Instagram to Facebook posting interface, and possibly preferential algorithmic treatment for Instagram Stories in the Facebook News Feed, with Instagram essentially becoming a front-end publishing engine for the mothership.